My kids are quite adventurous when it comes to eating. They’ll try most things, and often surprise me by eating the most unexpected of foods with relish, whilst turning their noses up at something very, very normal. We still have episodes about ‘green bits’ every once in a while. The most striking thing about their eating habits is that if they’re involved in any way in the preparation of their food, they’re far, far more likely to eat it in the end. It doesn’t seem to matter how slight the involvement, even just doing some of the shopping seems to work, but if they’ve sat in the kitchen and peeled and chopped and measured and stirred, there’s a better than normal chance that they’re going to eat it. And so it turned out with this dish. A very unusual take on a familiar basic ingredient for our kids, this red-cooked pork dish simply disappeared when I put the finished bowls down in front of them. They’d shopped, chopped, measured and stirred and we heard no questions, no protests, no complaints, and saw two happy children wolfing down what’s actually a challenging meal for a young palate. Red-cooked pork is a fantastic alternative way of using belly pork. I usually just roast belly pork slowly in a low oven, and I still think that’s the best way to prepare it, but there are many other ways, and it’s a staple ingredient in a lot of Chinese cookery, particularly the more down-to-earth, home-focussed styles. Red-cooking depends on three things to make it successful – fat to coat and tenderise the meat, making it glisten and gleam, soy sauce to form the sauce and caramelised sugar to give it depth, sweetness and flavour. It’s a wonderful braised dish, a traditional one-pot meal with a long history – this was Chairman Mao’s favourite dish, apparently – and a million and one variations in its preparation. This version is adapted from the excellent Red Cook. The best meat to use is belly from the thin end – there needs to be a good proportion of fat to meat, so look out for a piece of pork belly that looks appetising and has nicely layered fat and dark, appealing meat. Get pork belly from a proper butcher, not a supermarket, if possible. 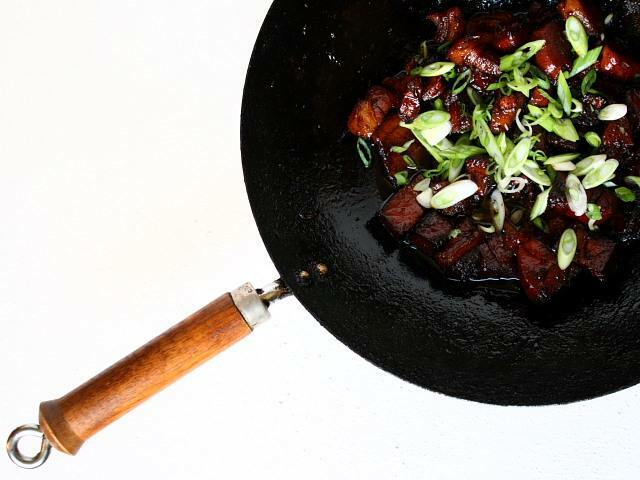 Cut a kilo of pork belly into thick slices, about two centimetres wide and place them in a wok. Cover with water from the kettle and bring to the boil, skimming away any scum that forms. Cook for twenty minutes, then remove the meat and strain the poaching liquid into another container and keep to one side … that’s pork stock, and it’s going back in later. Let the meat cool for a few minutes until its cool enough to handle without pain, then chop it up into substantial chunks, maybe two or three centimetres square. Wipe out the wok and put it back over a medium-high heat. Add two generous tablespoons of sugar and three of vegetable oil and stir to mix and dissolve. This will take a little while, perhaps a couple of minutes, and it will look unpromising at first, but the sugar will melt away and start to brown into a nutmeg like colour, a caramel smell rising in waves from the wok. Add the cooked pork back into the wok and stir and fry for about eight minutes. Keep the meat moving around so that it becomes coated with the caramelised sugar and takes on its golden colour. The edges of the meat will start to darken and catch, and it’ll shine in the fat. At this point, make a call about the amount of fat in the wok. There needs to be some there – it’s the point of the dish – but it needn’t be swimming in it. If you think there’s too much, drain some of it away. Now for the sauce. Add three cloves of peeled garlic, three spring onions sliced into two-inch lengths, three whole star anise, two tablespoons of dark soy sauce, and a shake more for luck, 60ml of Shaoxing wine and 350ml of the reserved pork stock. Bring to a simmer, cover the wok with a lid or a baking sheet, lower the heat and cook for forty minutes, stirring frequently to stop the pork catching on the bottom of the wok. After this, remove the lid, raise the heat and cook for another ten minutes, stirring the meat around, so that the sauce reduces and thickens, clinging to the meat and concentrating in flavour. Finish with more sliced spring onions and serve with plain, boiled rice and steamed vegetables. The pork is tender and the fat is tasty and succulent, all bathed in a thick, dark sauce, deep and tasty. So glad you’ve posted the recipe as I saw it on Instagram and it looked amazing. I’m such a sucker for Chinese food – think this is on my make list next weekend! Lovely! What a fantastic recipe. I certainly also remember it being true when we were children about being more ready to try things we had, at least seen being cooked. Failing that my mother would do the old lazy trick of making the food on the plate look like a face and, for whatever reason, that also guaranteed clean plates!